In some of our previous posts we have commented on the color trends in the upcoming autumn season. We have also a good few times declared that autumn naturally brings in a wide spectrum of colors and every one of them has its well deserved place in the fashion world. This time, though, we need to admit that a new hot favorite has taken over the leading role – the burgundy and its shades have occupied the first place. This post will take a closer look at this intoxicating color by revealing what its place on the fashion podium is, what the best matching accessories are and which colors blend well with it. Just switch the TV on and spend five minutes watching the fashion channel. 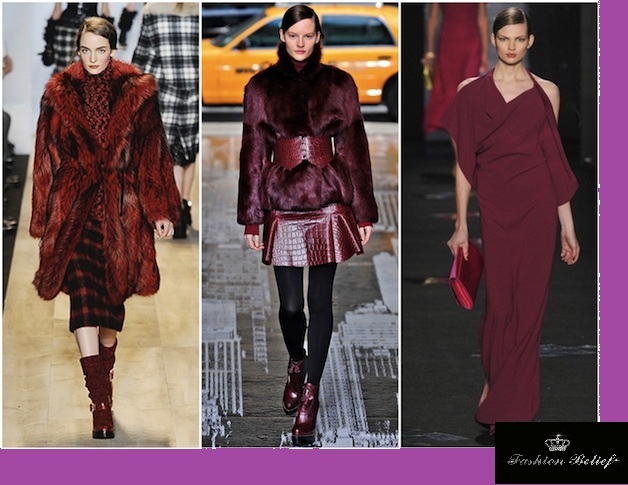 Burgundy is everywhere – coats, evening gowns, boots, and bags. As a matter of fact, all red nuances rule in the current fashion trends, however the leading role is given to the wine shades. The burgundy military style doubled breasted jackets by Tommy Hilfiger and Alexander Wang will literally fill the air with vitality. The burgundy is the most preferred color for the lapel and epaulette coats, the pencil skirts, the pantsuits and the asymmetrical dresses. It is true that the burgundy is very powerful and enchanting as a color that most designers rely solely on it as their primary choice. However, if we are to pick the right companion, we should point out that orange, cobalt blue, olive green and sand yellow will add to the impeccable impression created by this divine color. As for the right accessories, a quick look at Viktor and Rolf autumn collection reveals that the burgundy is the number one choice when it comes to lipstick as well. The color conveys the idea of a fresh autumn kiss. The Rachel Roy wine manicure will simply fulfill the impeccable vision!